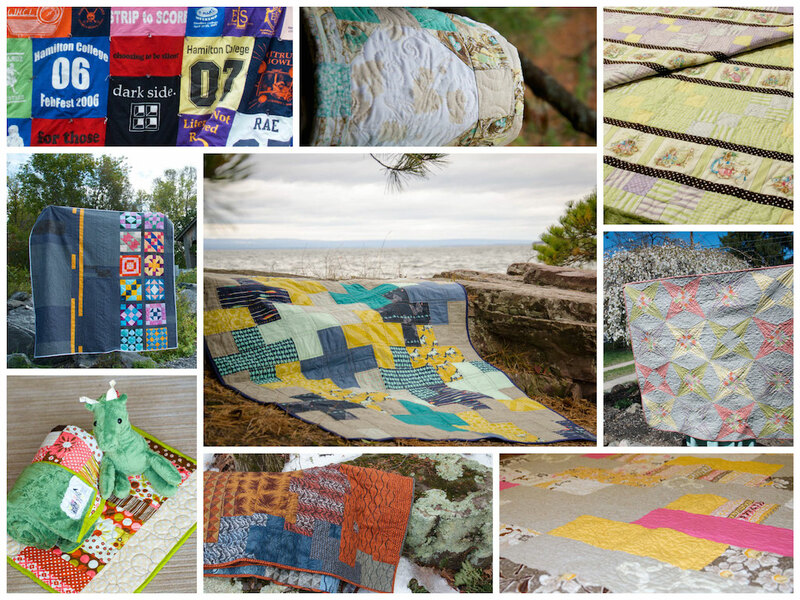 As I sat down to write this year’s review post, I realized that I was behind on posting by multiple quilts and other projects yet again. And worse, it wasn’t due to a lack of time like last year, but general lack of motivation. So, after spending a couple of weeks thinking about it, I’ve decided that I’m going to stop blogging in 2019. For now, this site will stay up. Thank you to those of you who have stuck around all these years. That said, here’s 2018 in review. I didn’t finish nearly as many quilts this year as I have in the past, and most of them were rather small quilts. But, I did manage to knock off one old work in progress and a second that was not as old, but I was just as pleased about clearing out. 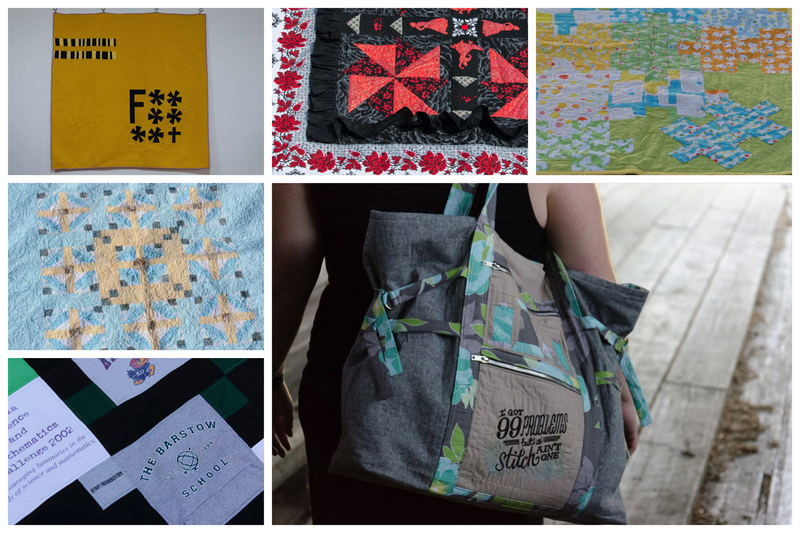 It was the year of small quilts. All but Volute (Bang!) 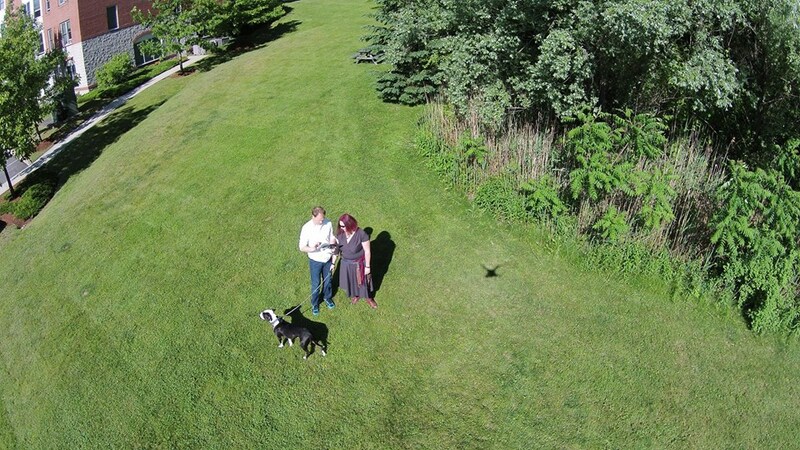 were 42″ square or smaller. It almost motivates me to start the process of quilting my giant pixelated churn dash again (queen bed-sized, 1/2″ lines). Volute (Bang!) 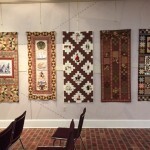 hung at the Vermont Quilt Festival. Mustang Summing, All the Ys, and The Sum of Scraps all hung at the T. W. Wood Gallery in Montpelier, VT for a show in October. Give a Flock finished up the Block of the Month my guild kicked off in mid-2017. I signed up for our 2018-19 BOM as well, and three months in, I’m still caught up. Welcome was started after I learned about the Welcome Blanket Project. I gifted it to the project after finishing it. While I was living in Atlanta, I took advantage of the wide variety of classes I could access and different materials I could buy in-person. As a result, I did more non-quilt sewing than usual. That included knit leggings, a sweater/sweatshirt, a waxed-canvas bag, and espadrille shoes. That’s in addition to a variety of zip pouches, and random other small projects; none of these made the blog. Aside from the two quilts I finished from this backlog (Volute, formerly Organic Spins; VTMQG 2017-18 BOM), I didn’t make much progress on it. I’m actively working on the one new quilt I started but didn’t manage to finish in 2018. One thing that was reinforced by my time in Atlanta is that I love sewing with people and learning new things. Sure, I can puzzle pretty much any technique out, but I enjoy learning them in person, with others. Rather than focusing goals on how many projects I might complete in 2019, I want to focus on learning things with people—taking classes, going to sew-ins, etc. I think there may be more garment sewing in my future as well, after reigniting that passion and receiving a serger for xmas. As well as I can remember, 2017 is the first year that I am incredibly relieved to see in my metaphorical rearview mirror. So long, 2017, and keep your fish next time. My time and motivation for sewing got pushed aside in favor of dealing with life. There were certainly some highs to go along with the lows, don’t get me wrong—we traveled to Alaska for our 10th anniversary, for starters! But overall, the theme of 2017 sewing seemed to be “whip up this gift before a deadline,” and had very little “me time, addicted to this project” sewing. 2017 was all about babies. So many baby quilts. And, a lack of blogging. I still owe you all some words about numbers six, seven, and eight. I also finished a mini, “All the Ys”, that took up a third of my Instagram #2017bestnine slots (of course, then I decided to be lame and not even post the collage to Instagram after it generated). I never quite know how to categorize minis—part of my list of quilts (currently 52 finishes, not including minis)—or part of my list of random small projects every year? Something to think about in the future if I start making more than one or two a year, I suppose. * This isn’t exactly a finished quilt, but is a completed iteration. Semantics. 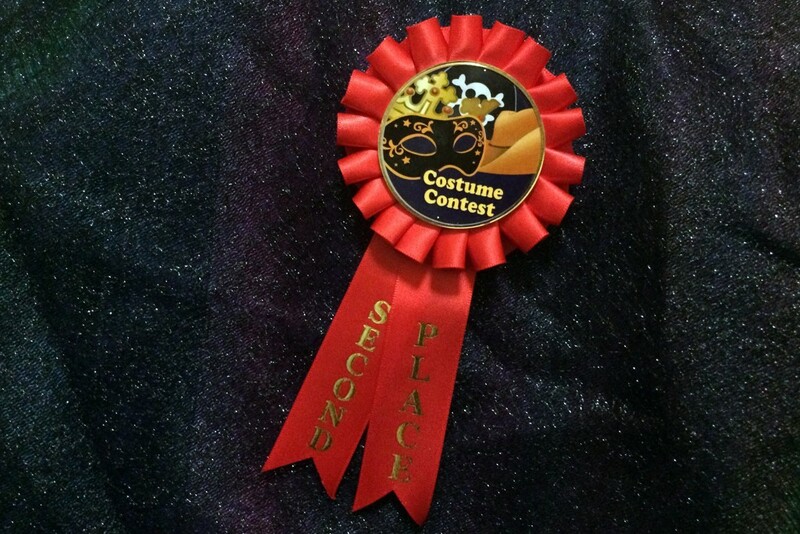 Human hung at the Vermont Quilt Fest and won a second place ribbon on its own merits. Cyclist was also present at VQF, in the “Lobby Lights” exhibit along with many others by my guildmates. With my crafting mojo as limited as it was, I didn’t get involved in much this year. I started participating in my guild’s block of the month, but only finished the first two months. I’m about six behind at this point (we started mid-year). I helped my guild piece #quiltsforqc quilt tops during a sew-in, but that was it for various collaborative projects. I barely touched my existing project backlog this year. I did finish one old project, Sampler On Point, which officially finishes off my old sampler projects from Utica. And, I made the first full panel of my history quilt (48 blocks). But, I started two projects in May that I didn’t touch again after August or so, which means I’m technically net negative on backlog progress. Looking back at my 2016 review, I didn’t do a great job of being on the same playing field as my goals for 2017, let alone accomplishing them. Which, of course, makes me hesitant to make any goals for 2018. That said, I’d like to finish a quilt to enter into VQF this year. I’ve found the feedback from judges very interesting for the previous two years. At the time of writing, I hope to finish up Organic Spins once and for all, and enter it. I started it in September 2011, which makes it my oldest work in progress that I’m still trying to finish as originally envisioned. I’d also like to catch up on posting about my final finishes of 2017 before too late in the year and keep up in 2018. Thanks for sticking around! 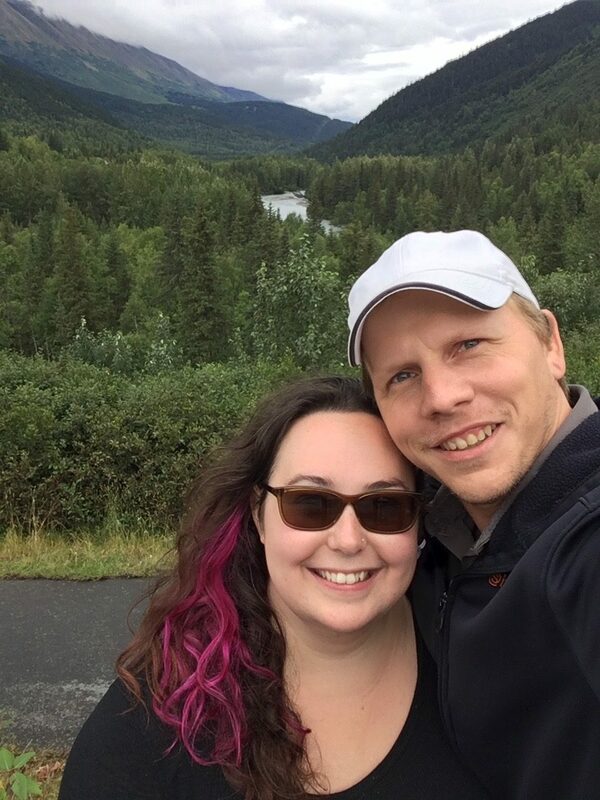 Carl and Rae outside of Hope, AK. August 2017. When I sat down to write this, it struck me that my opening could be much the same as last year’s. Again, we traveled quite a bit. Again, I changed roles at work (back into development, still team leadership). But, I also spent weeks on end not entering my studio space, not sewing, not dreaming up projects. 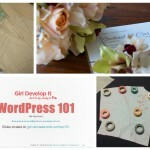 I posted the fewest updates here since I started keeping this blog in 2009. So, this will be a pretty minimal roundup for the year. I was surprised to realize that I finished one more quilt this year than last. The finishes fell evenly into three categories: baby quilt gifts, donations to my guild’s community quilt drive, and ones I kept. 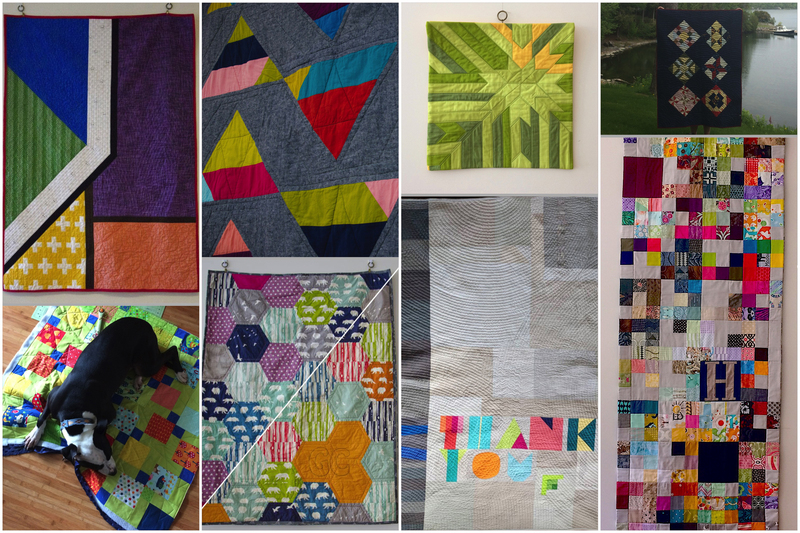 Every quilt I finished this year was either a pre-existing work in progress or made from stash. I’m happy to see my backlog of started projects shrink a little more. Despite the stash projects, my collection of fabric actually increased exponentially this year (more on that later), but it was nice to use up some of the older bits. 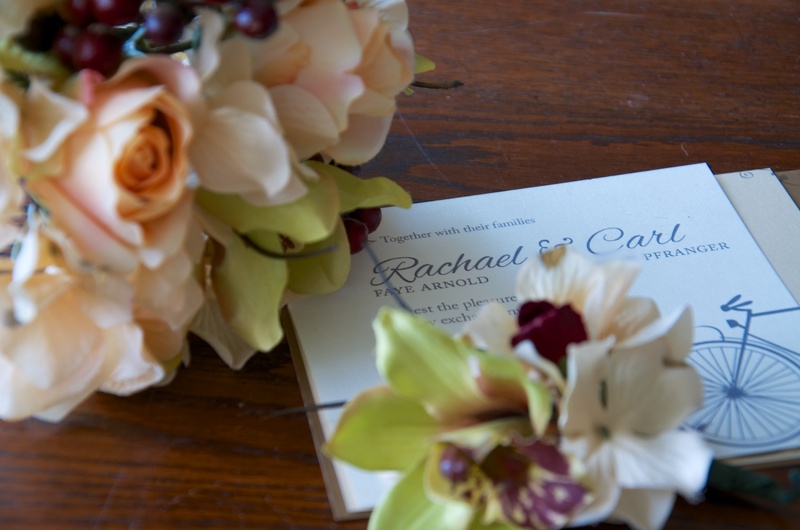 Despite not blogging, I did more to show my work in real life than I have in past years. The F-word hung at the Vermont Quilt Fest. I don’t think it was very well received, but one of the judges gave me some insightful feedback, so it was a satisfying experience. Human hung at the Squam Modern Quilt Show hosted by the Cambridge MQG and Gather Here, as well as in a special exhibit by the Vermont MQG at the Champlain Valley Quilt Guild’s show this year (an exhibit I also organized, which ate up a chunk of time). After four years of traveling the country (and to Canada), my 1812 Challenge Quilt finally came home this summer. 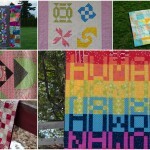 I signed up for the Mighty Lucky Quilting Challenges this year, but only completed two of the challenges. January’s bias tape challenge resulted in a mini art quilt, and I made a pillow of quilted words as a result of June’s challenge. I also made a few blocks for two quilt drives (along with other members of my guild): #quiltsforfortmac and #quiltsforpulse. As the year draws to a close, two articles I read this year have really stuck with me and will likely play a role in how I look at things in the coming year. 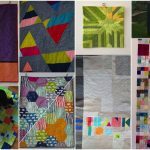 In the first (from 2014), Cheryl Arkison talks about why she doesn’t limit the number of projects she currently has “under construction.” As someone who spent the previous three years making a concerted effort to reduce the number of works in progress I have, it may seem odd that in many ways I agree with her. But as she discusses in the section about creative challenges, I do think there can be value in having a variety of projects to work on. A lot of my focus has been on clearing out projects that never really called to me in the first place, but that I didn’t want to abandon. What is left is a collection of very different ideas that are simply waiting for me to be in the right mood to explore. The other was Abby Glassenberg’s article about how language matters and the often exclusionary nature of how we talk about quilting. While I think the entire article is spot on, the section at the end about fabric stashes struck a particular chord. I purchased over 60 yards (yes, really! I couldn’t believe it either) of fabric this year. Some was to supplement what I already had to finish in-progress projects, but much of it was taking advantage of sales two local shops were running (one was moving, the other closing). Mere days before the article came out, I made one of those throwaway small-talk jokes to the fabric store clerk at checkout about my husband’s likely horror of such a large purchase and maybe I should sneak it inside. It was also mostly a lie, because he doesn’t really care and I felt no guilt (also: I’m a terribly awkward person in conversation most days, especially for small talk). It was one of those things we say to act like everyone else. Just like all the brainless micro aggressions that continue to feed racism, sexism, ageism, all the other -isms. In other words, this is the year that I managed to turn buying fabric into a great philosophical event for myself. That’s all a really long way of obliquely saying that in 2017 you should expect more ‘statement’ projects (a lá F-word, Human), and more stash projects (fabric palette projects?). 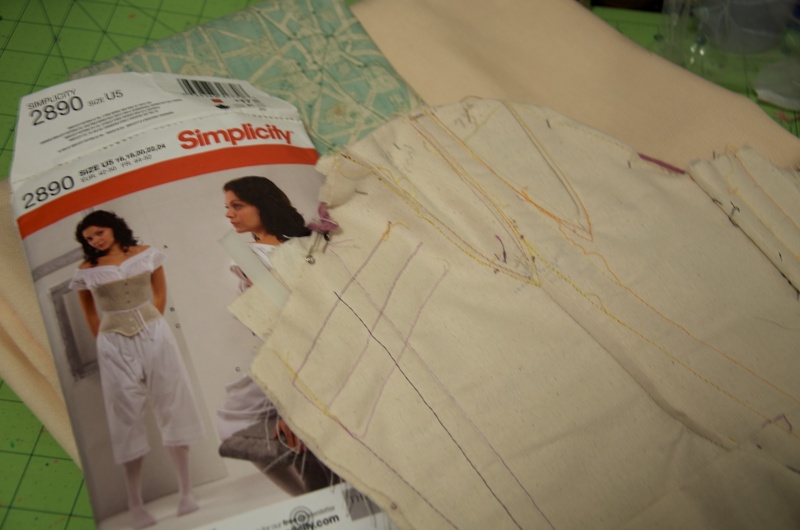 2015 was an odd year—it went by in a flash and I sewed much less than I have in recent years. We traveled more than in the past and for longer stretches of time. I started a new role that is less about development and more about guiding a team, became co-leader of our local Girl Develop It chapter (an organization that aims to teach women to code), and made progress with the learning curve of both of those changes. Sewing (especially quilting) took a back seat. What I did sew, I did with real intention and a certain level of dumping things out of my brain and sewing space. 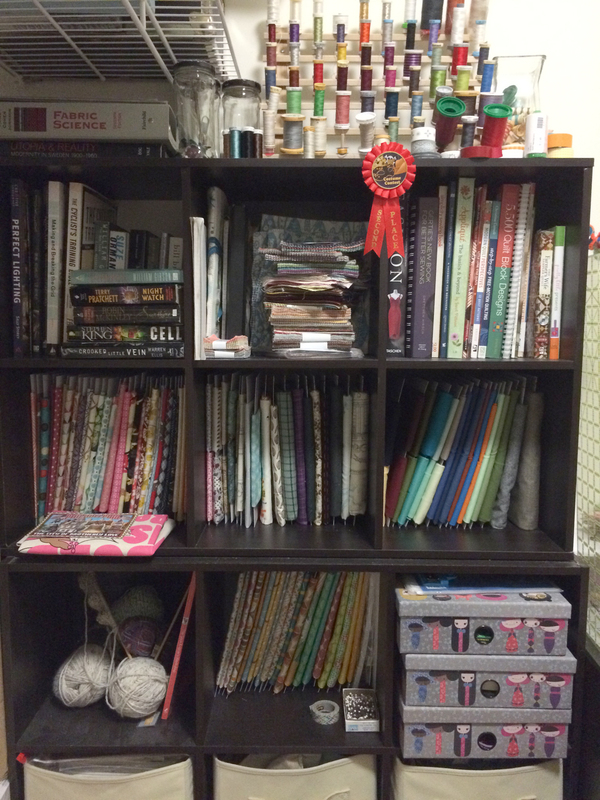 At the end of 2014, I made a resolution to clean out my works in progress (the quilting ones, at least). Three-fifths of my quilt finishes this year came from that collection, and I worked on a few others. The second part of the resolution—that I not add to the list—wasn’t met. I started two projects that are still unfinished. For the first time, this year was about finishing things—and in one case making a statement—not about gifting. In fact, the only quilt of the five gifted was the first—a quilt for a new cousin in my generation. Getting the F-word out of my head and into a quilt was extraordinarily satisfying, and one of the unfinished projects is something else in that vein. 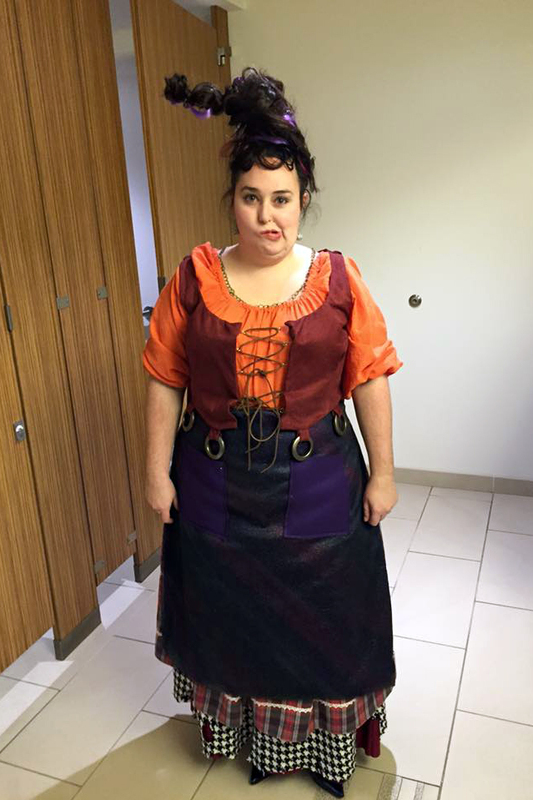 My one wearable was a Halloween/Cosplay costume for Mary Sanderson. 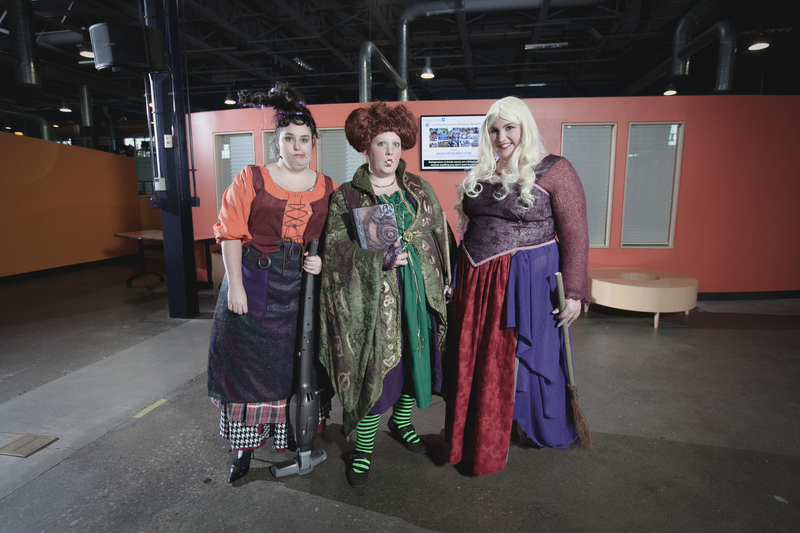 I’ve loved Hocus Pocus for 20 years, and was happy to jump in when my coworkers wanted to dress up as the three Sanderson Sisters for our office costume contest. 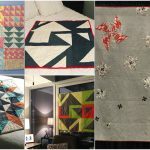 Not only was this a slow year for quilting, I sewed very few smaller craft items. My Art Student and the Cottage Garden bag is an all-time favorite and took about the same amount of effort as a typical quilt. I contributed blocks to two charity quilts for my guild, pieced the back for one of those, and made a block for a quilt Thomas Knauer is doing. But, I did nothing with others that will end up in a project of my own. Again, this was the year of cleaning out works in progress. I went into detail on the ones I made progress on in a Mid-year Progress post. Progress since the progress report: I finished one quilt, decided Drunkard’s Compass will never be completed as designed and returned the fabrics to my stash (there are a few blocks finished that may turn into a pillow cover or something next year), and found the heart block for the Miniatures 9-Patch during a massive organizational spree in November. I have a couple of very specific finishing goals for 2016: I Am Human, Work In Progress, Miniatures 9-patch, and a baby quilt in January. Beyond that, the majority of my guild (including me) decided to participate in the Mighty Lucky Quilting Club so I want to keep up with that. I finally organized the larger pieces of my stash (comic book boards as mini-bolts for the win). 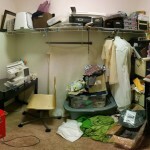 I hope I can keep up with having my sewing room organized. I still need to deal with all of my scraps that are hidden in various bins and boxes. I’m loathe to commit to much, because I think 2016 is going to turn out much like 2015 in terms of work and traveling. Looking forward to seeing how it goes! Winifred: Don’t get your knickers in a twist! We’re just three kindly old spinster ladies. Mary: Spending a quiet evening at home. Sarah: Sucking the lives out of little children! The big reveal (two months late): two of my teammates and I dressed as the Sanderson sisters from the movie Hocus Pocus, and won second place in our company costume contest! I was Mary. 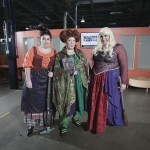 Me, Sarah, and Bethany as Mary, Winifred, and Sarah Sanderson. Photo by John Sappo. 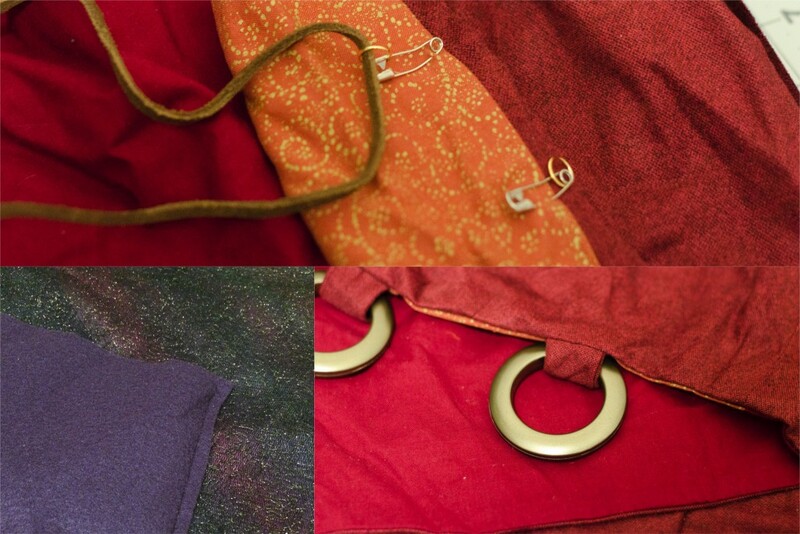 I ended up hacking the bodice, apron, wig and cape together without in-progress photos and never technically finished it (safety pin lacing holes for the win), so this post will just show photos of the ‘finished’ costume as I wore it for our office contest with a few notes on modifications. I showed you the various skirts and chemise in previous posts. The bodice (from Simplicity 5582) ended up being very straight forward, except that I bag-lined it instead of using bias tape to finish the edges. I wore my (also not completely finished, despite being made in 2012) regency corset under everything, as the bodice is made of a fashion knit with interfacing and a cotton lining, thus had no shaping ability. I have yet to finish the lacing holes and used safety pins the day of. The fit is horrible. Despite matching my waist measurements, there was no way the bodice would close (partly because of the added bulk from the skirts). I added an extra inch to the front, but it still wasn’t enough. The cape is attached at the shoulders (more safety pins), and was only hemmed at the top: the sides are unfinished (the knit doesn’t ravel), and the bottom is selvage. I had to seam it up the middle due having two pieces of the fabric, and not enough forethought. I chose to use the knit because it had a printed pattern that looked like a rough texture, while being simple to work with for a costume. 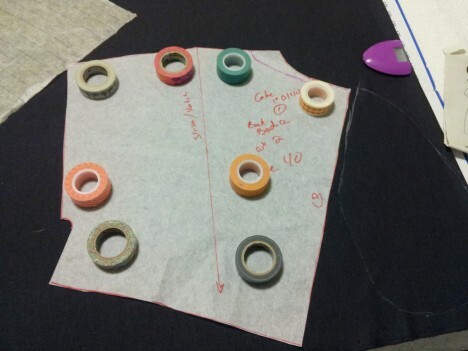 The apron is just a rectangle of fabric (actually three (felt and fashion tulle), layered, to get some texture). attached to a waistband, with patch pockets. I couldn’t find any multi-colored fabric with the right boucle texture. The hair was fun—it’s a mix of my own and a structured wig piece. I made a base out of a styrofoam cone painted black with wire in the top, then hot-glued hair clips to the bottom. 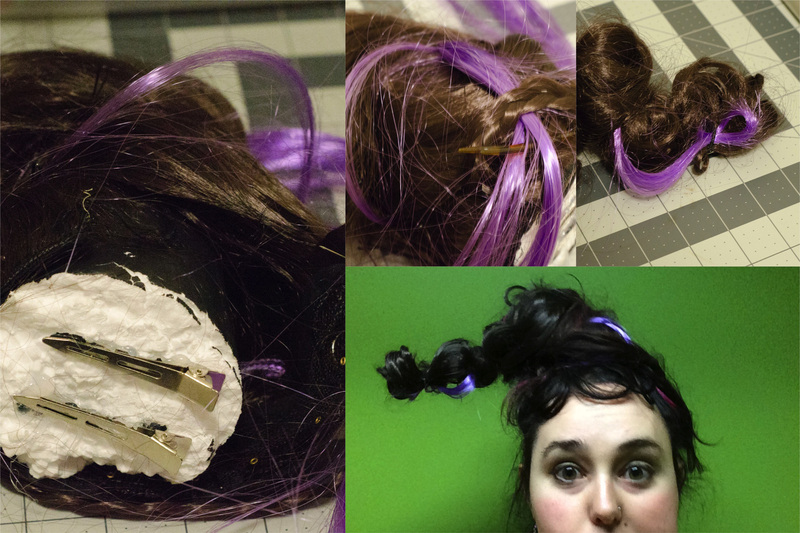 Then, I attached a hair extension piece that matches my already-dark-brown hair and clip-in purple pieces to create the structure for the shape. When wearing it, I twisted my own hair up onto the base and used a ton of pins, which held it all in place. Since I already have bright pink highlights, it was a little more jazzed up and multi-colored than Mary’s, but worked out surprisingly well. If I wear this costume again in the future, I’ll finish up the lacing on the bodice, and add the accessories that really make something like this work (rings, earrings, proper shoes), but it was a lot of fun for an afternoon at work! 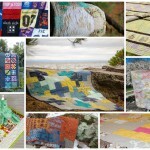 It’s been three years since I finished the War of 1812 challenge quilt, and it’s still traveling around as part of the Great Lakes Seaway Trail 1812 Quilt Challenge traveling show! 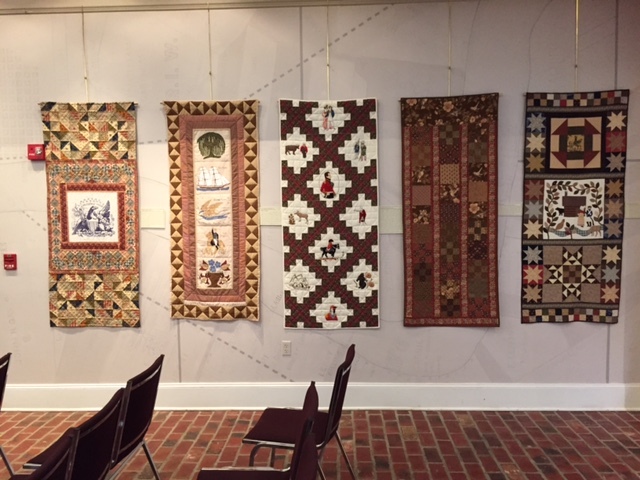 This winter, it spent time in Baton Rouge, and is now on display in the Classroom Gallery at the New England Quilt Museum through June 28. I never would have guessed I’d be saying “one of my quilts is hanging at NEQM!” when I first started working on this one in 2011. 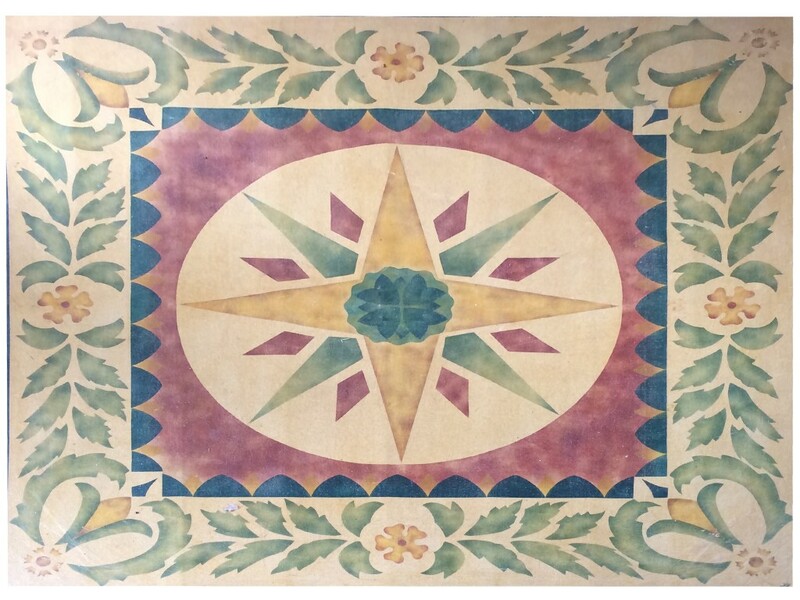 It’s been a while since we’ve been in Lowell, but if we make it back there to see the 1812 quilts hanging, I hope to stop at the American Textile History Museum as well. I visited Shelburne Museum multiple times when it was hosting the ATHM’s traveling Homefront & Battlefield exhibit. I don’t buy a lot of quilting books, because I rarely want to make the patterns they contain (although inspiration is nice), but Homefront & Battlefield: Quilts & Context in the Civil War made it into my library because of the history. That show’s currently at the Great Plains Art Museum in Lincoln, Nebraska. The book is dense but interesting, and has highlighted a few other museums I’d like to visit due to objects from their collection being involved in the show, including the Rokeby Museum that is just down the road from home. While the quilts in the show were wonderful to see, I was facinated by a shaker-style dress that belonged to Rachel Rokeby. The construction details were very interesting, including the obvious use of selvage along the skirt side seams (and pocket openings), and a very-tightly blanket-stitched hem. We spent 10 days in April traveling from VT down to SC and back, with a chunk of time in Virginia. Between stops at Ashlawn-Highland, Montecello, and Colonial Williamsburg, I think I’m inspired to make another more traditional quilt in the coming months. 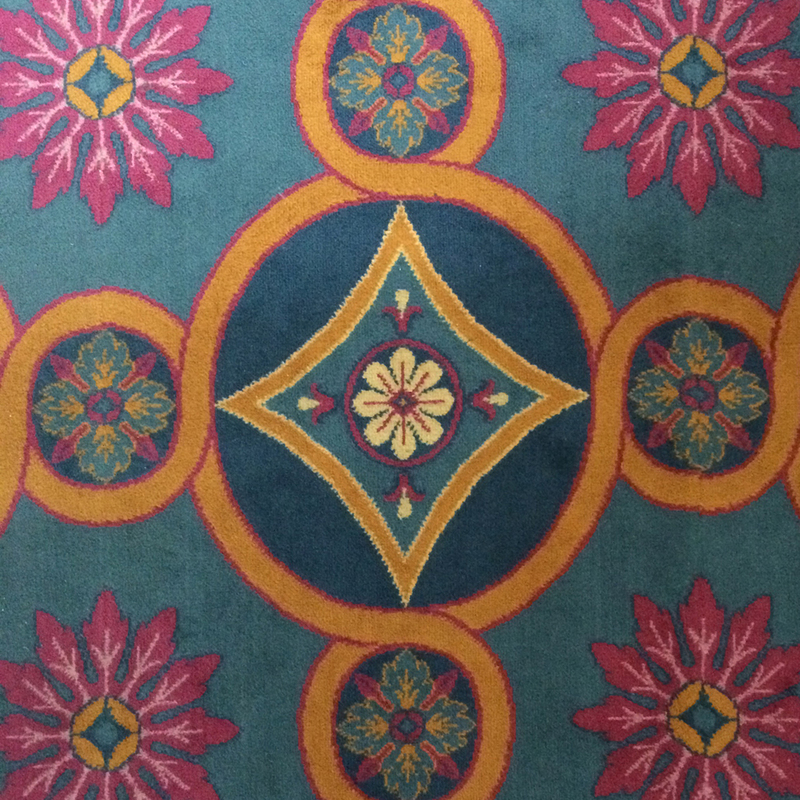 I was focused more on experiences than photographs, but even floor-coverings were inspiring. For now, though, I have a few more modern projects to muddle through. I haven’t sewn much this year, but I managed to put a dent in my current work in progress at the guild’s sew-in this weekend! One doesn’t simply walk into sewing in the new year, at least not if you’re me. My first project of the year is cleaning up my sewing closet. Every surface is covered, the floor is littered with debris of projects, and I still haven’t had my wedding dress cleaned. Hope your new year is starting with more stitches than jetsam. When wedding planning took over all my free time during the spring and summer, I didn’t expect to finish many quilts this year. Once the day had passed and life settled back to normal, however, I found myself manic with quilting motivation. In the end, I finished two more quilts than in 2013! In January, I posted about wanting to improve my skill at binding. I ended up only hand binding one quilt (Stars For Lennon) and feel much more comfortable machine binding. Yay! 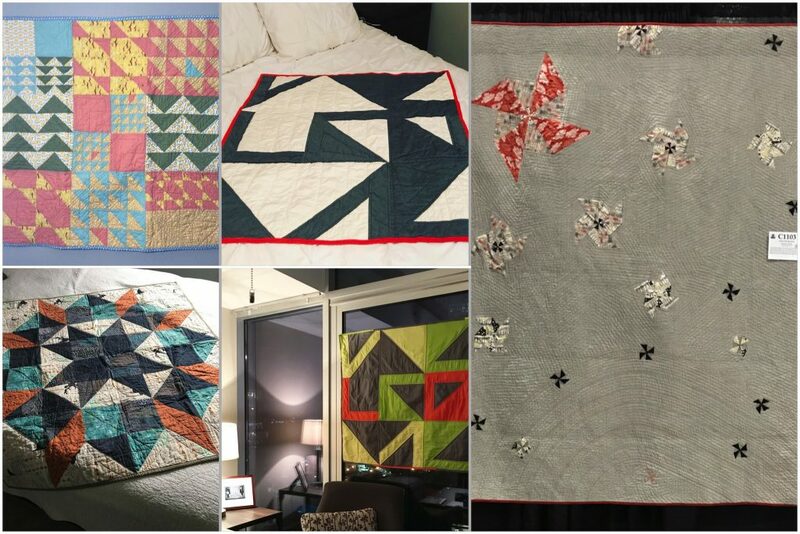 Four of the quilts were made with specially-purchased fabric, three were entirely from stash, two only required a purchase for backing, and one was an even mix of stash and new purchases. Additionally, three were long-time works in progress which I’m happy to be done with. Better yet, I didn’t start any quilts that weren’t finished this year. Despite purchasing fabric lengths for a few different dresses, I only finished one, and never managed to blog about it (or take blog photos, for that matter). It’s a second Tiramisu that I have worn so often that the cheap jersey is starting to pill, and needs to be taken in from stretching out. I guess that is a good thing, in this case? The unofficial theme for crafty projects this year was embroidery, evidently. I embroidered a few things for the wedding that went unblogged (a lingerie bag for me, Carl’s pocket square, and jewelry bags for my bridesmaids). I also made tea towels, potholders, keychains, and stockings in addition to the typical mix of doll quilts and stuffed animals. None this year! Now that we’ve started an official Modern Quilt Guild here in VT, perhaps that will change in 2015. One of those quilt finishes was from a previous sampler, though. For once, I didn’t add to this list. I even managed to remove three things from it (well, technically I only remembered to add one of them to the 2013 Year in Review, but the other two should have been listed). I have one or two more with all the components sitting in a box, waiting to be cut. And, on the blogging side of things, I should probably finish up this site redesign! I don’t know what 2015 will bring. 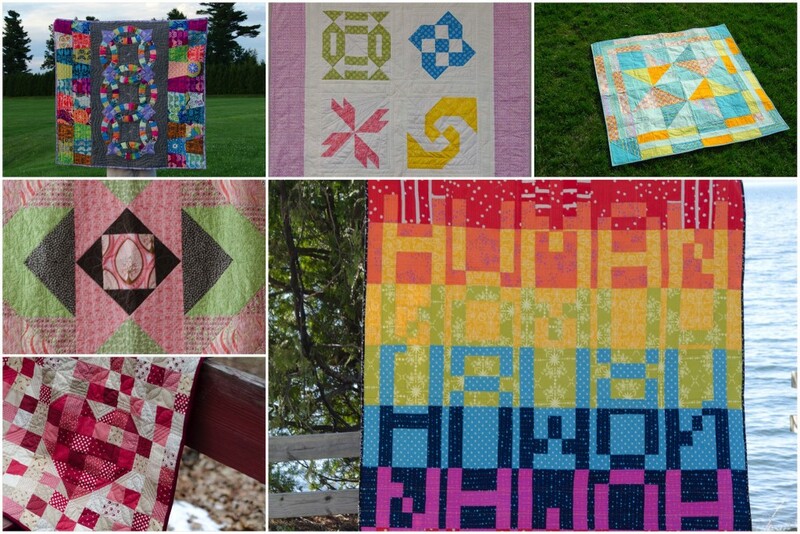 I would like to continue making quilts for our nieces and nephews (six down, seven to go), and there are a few other people in our lives I’d like to create something for. The one resolution I will make is that by this time next year, I’ll have done something with every unfinished quilt project listed above. Something might be progress, might be finishing, might even be officially giving up and repurposing/donating the completed parts—there just will be momentum of some sort. And, I won’t add to the list. Sounds like a good way to start, at least. 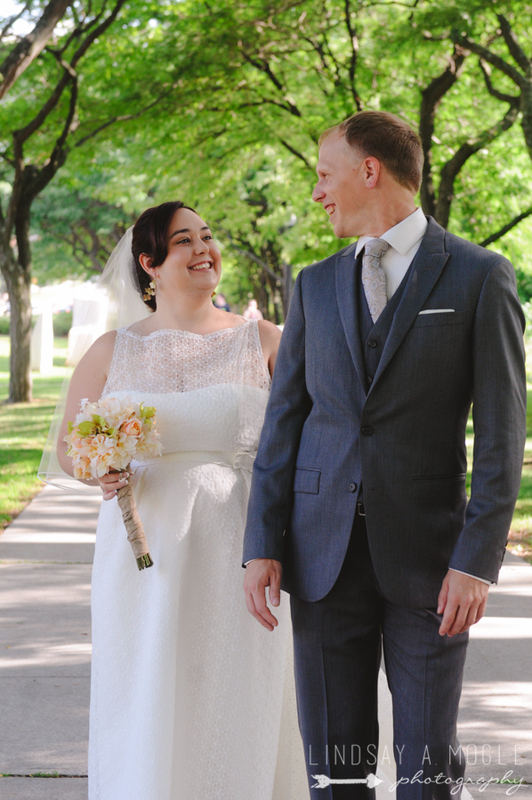 Our seventh anniversary was at the end of August. Usually, we take a trip over Labor Day weekend to somewhere we haven’t yet been. This year, it turned into a honeymoon the week before. I’m very glad it’s a once-in-a-lifetime event—I’m not an event planner, that’s for sure. Now I have time to get back to fun sewing and updating! It seems like I just put the finishing touches on my last quilt, but here it is the end of May and I haven’t touched a bit of quilting cotton (or quilting linen for that matter) in the six weeks since I completed it. It’s going to be a quiet summer around here; I haven’t spent much time in the sewing room and that won’t change any time soon. To some degree, it’s lack of inspiration. I have plenty of unfinished quilts that need work, and ideas for new ones, but none are screaming at me to work on them. I have played with knit fabric a little bit, and learned that my collection of washi tape makes for great pattern weights. The dress was actually completed in one four-hour session last weekend and worn this week, however I haven’t yet taken photos. A couple of iterations later, I’ve fitted a modified Simplicity 2890 to me and have the busk and bones on order. Don‘t get too excited. I have nothing to wear it under, and nothing planned. I just felt like making a corset. It may be ugly, but it fits well—the whole point of a mockup. Even if I had a burning desire to work on any of my current quilt projects, plenty of things outside the studio have devoured my time. 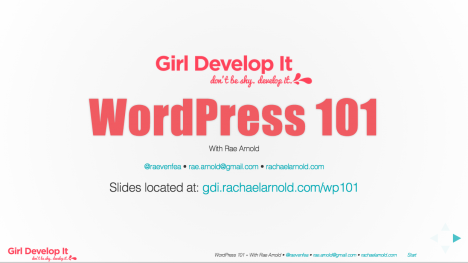 I taught a class for the local chapter of Girl Develop It, which aims to get more women involved in programming and development. I’ve been arranging flowers. And designing stationary. Time sink. All the time, all the planning. Really, a multitude of things, so this may be the Summer of No Quilts (title case assures proper gravitas). Have no fear as I assure you there are plenty to come this fall and winter. In the month’s time since I last posted, my friend Katherine awarded me the Liebster Blog Award. Hers has been a staple of my RSS feed for many years now, with an eclectic mix of posts about jewelry (she makes fabulous math-inspired things, including the beadwork for my Full Adder brooch [unblogged] that is the only completed part of that steampunk costume I was going to make); feminism (and women in STEM, a subject obviously dear to my heart); book reviews; writing; being an ex-pat first in South Korea, now in Sweden; and nerdy things (among other topics). I may one day have the time to fulfill the rules of the award and comb my RSS feed for other small blogs worth reading (I’m sure there are many, I just don’t keep tabs on how popular they are), however today is not that day. Regardless, it’s much appreciated, Koba.